wheels, One at Elista in Kalmykia, and the other at Arata Square in Tuva. 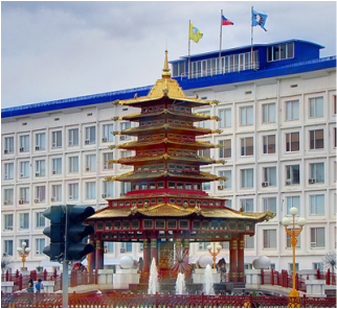 These prayer wheels were both installed in front of the local government buildings, and they have become landmarks in their respective regions. 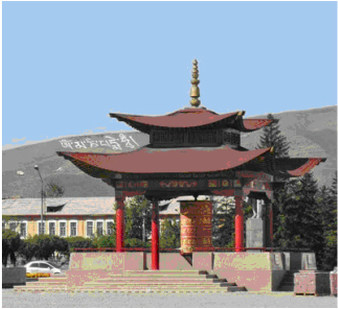 They also became popular tourist sites, creating great appreciation for Lobsang's gift. Lobsang also had an idea to create the Compassion Buddha's prayer, Om Mani Pedme Hum mantra, on the Tuva mountains. It was layed with white rocks across at least 150 meters in length (See left photo below).